32 mm XRF sample cups. Double Open Ended w/ Lid, Suitable for Rigaku NEX CG, PANalytical® & Spectro® XEPOS, XLAB 2000. 3000 E Profile cups are disposable 3 piece XRF sample cups consisting of 2 large sleeves (Inner, Outer) and a pre-ventable lid which assembles together by way of telescoping into one another delivering a wrinkle free surface producing replicate analytical results. 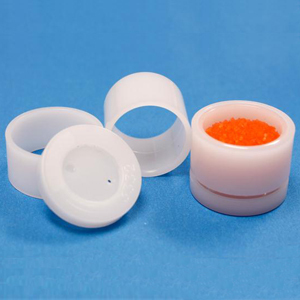 These XRF Sample Cups are designed with our bi-directional oversize sleeve to facilitate the assembly for the analyst by not having to check which side of the sleeve requires to be placed on. It is coupled with an elongated sleeve that optimizes interference of mating parts. Samples are top loaded and pre-vented lids easily snap onto the Inner.